Angtropin [rDNA origin] is a way to supply natural growth human growth hormone for people who may deficient or may require higher levels of this hormone. 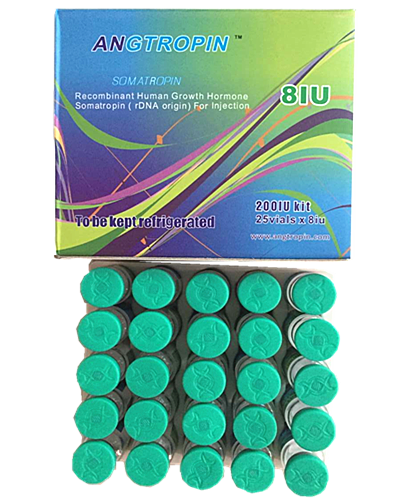 Angtropin is identical to natural growth hormone that your pituitary gland produces because it is made by secretion technology that makes a 191 amino acid sequence. Angtropoin is an injectable human growth hormone of the highest grade. HGH which is naturally produced by the pituitary glad is responsible for many functions in the human body. HGH promotes muscle development while decreasing fat, promoting a favorable body composition It also helps with lowering cholesterol and feelings of well-being. People who are deficient in GH usually have weak bones, decreased muscle strength, increased body fat, higher cholesterol and may suffer from depression. Angtropin may help in such cases.